Today, my “much better half” insisted that our dog Chico could understand Korean. She showed me how he could understand Korean and sit and stay, even give paw. I had a good chuckle. Not much different to many teachers who believe their students understand them in the classroom! Chico, like so many students, was great at “faking it”. Doing the right thing for the wrong reason. I think all of us teaching English, have to remind ourselves that though it might seem that our students understand – a lot of time, even most of the time, they are faking it. I remember especially in my first years of teaching, fully thinking that the nodding, the “yeah, yeah”, “ok” of my students indicated that they’d understood. 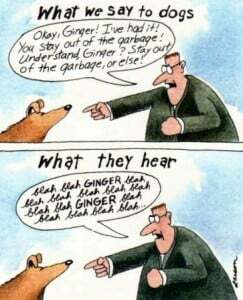 However, what was happening was probably much like this famous Far Side comic. Our students often are “bewildered” (to borrow a term Frank Smith uses often in reference to children learning to read). There is overload and the brain is overcome. But there exists a powerful need to believe in the pragmatic elements of communication (the facial expressions, gestures, eye contact etc..), also the hints and inferences of half meaning that pass along as communication. We want to understand so much and we want to communicate and please the other so much – that we “fake it”. Nobody wants to say, “I don’t understand”. Not that faking it is all bad. It is only bad if “learning” is your aim. If you want to be social, faking it can be a great strategy. Or if you are asking for directions in Spanish and are confronted with a flood of Spanish that you can’t understand at all – it can be a quick way out of a sticky situation. Still, as a teacher, we should be aware of how learners, “fake it”. Otherwise, we can’t adjust our lessons and content appropriately and we become teachers who “fake it”. And yes, they exist! In my experience, “faking it” is an art undertaken in abundance by teachers. Like the Cuban joke about communism, “they pretend to pay us and we pretend to work”, — “teachers pretend to teach and students pretend to learn”. It happens a lot. 1. Model more, explain less. Think through how you’ll explain the stages and activities of the lesson. 2. Get Ss speaking and doing the explaining. They’ll bring it down to the level of the audience and the communication will be much more effective. 4. Speak less – decrease teacher talk time and let students have more opportunity for production rather than reception of language. Previous story Words, Words, Words…. it is a true for all what you say, but we need long time to left this . Thanks for dropping in and yes, I remember that letter from quite a while back. I’ve used the Farside in my classrooms a little over the years. Your question is more complicated than it appears. But to first answer it directly – No. Didn’t ask him nor do I feel I have to. If I paid $5 for the sites offering it – would that make everything all right? Of course,if he asks for me to take it down, I would. But I’d also say the following…. Look through my blog. I’m an ardent supported of the notion that education needs a “free pass” and access to the world’s materials. All those who value the education of our children should think so and support this idea. There is only so much we can “proprietize”. Further, there is fair use. One comic is not the same as to those which that letter was addressed, the many putting up the comics wholesale on their sites + making money off their sites. Everything I do is non profit and I haven’t made a cent from the years of service to teachers online. Further, further, how long does copyright last. As far as I can tell, this comic is over 24 years old. One can’t have their cake and eat it too. Meaning, this image is used in the public realm constantly and been monetized to the nines. It is almost iconic and I can also off the top of my head remember 3 presentations where the lecturers used it. Should this go the road of Mickey Mouse and Disney. An idea that is owned? I would venture this IS the public realm. But in any case it is the non profit and educational realm, so I’d say it gets a pass. Our children (and this includes the idea of educating teachers – which I do) really need to be able to use (and abuse) images. They need to discuss them and debate them. If Gary Trudeau really would like to be sure his images aren’t abused, he should have kept them in his little notebook. Sorry, that’s my opinion on the matter. Again, wholesale abuse is something else and I support the non use of his creativity in that fashion. Sorry for the drawn out comment but felt you needed to hear it. No I’m not faking it. I think it is hard for us language teachers to take a firm stance on the input vs output issue. We tend to give in to conventional wisdom, ride the fence and espouse an eclectic approach to teaching even though research seems to tell us otherwise. Good point Kriss and I should really have been clearer but wasn’t really writing to reference the two posts (this one was written before the “Cart before the horse” post. Decrease TTT (teacher talk time) so you aren’t faking it and taking up valuable class time with a lot of non CI (comprehensible input). I’ve been in so many classes where there is just too much of a glazed look among students and the teacher is really speaking, helping with input 1, 2, 3 students in the class. Speak less and decrease TTT to give students more CI through well organized/prepared input activities. These can be extensive reading using graded readers, leveled audio stories , materials with text support etc…. The point is – speak less so the students have more on task time BUT with input that is helpful and not “bewildering” , a term I use a lot but I think appropriate. It is when the brain just gives up and meaning, the search for meaning, goes out the window. (and it would be interesting to investigate the notion that it really is “endurance” and not “plasticity” that is involved with young learners being so good at language acquisition. I hope that clarifies things a bit and yes, I’m with you. Most teachers do “espouse an eclectic approach” – sometimes that is for the benefit of students, sometimes not. Hard to know, from a distance. But you are right, research tends to label and put in nice rows a lot that is actually much more complex and messier.